In the previous entry, I mentioned Emacs version 23. This time, let's see what we can do with one of its new features: D-Bus-support. As you might know, D-Bus is an IPC system used on Linux/Unix to communicate between applications; it's a kind-of successor to systems like Bonobo (Gnome) and KParts (KDE). With support for D-Bus in Emacs, it's easy to control other applications. More and more programs are providing D-Bus interfaces. As a semi-useful example of that, let's look at using D-Bus to control the Tomboy Note Taker application. Tomboy takes a novel approach (at least for me) at note taking -- your notes are connected like a wiki. Tomboy was originally designed and written by Alex Graveley, who has a talent for coming up with interesting ideas, and then turning them into software. Anyhow, I only use Tomboy as example of the use of D-Bus from emacs; there are many other interesting programs controllable through D-Bus. Note, I won't discuss the details of D-Bus itself here; there's a lot of good material available already. Specifically, for some more background on using D-Bus with emacs, I can recommend the documentation (info-page) that comes with Emacs-23. "call the tomboy method METHOD with ARGS over dbus"
"Create a new note with in the Tomboy notetaker from region"
"Insert Tomboy note with NAME"
So, easy enough to do, even for an Elisp novice like myself. 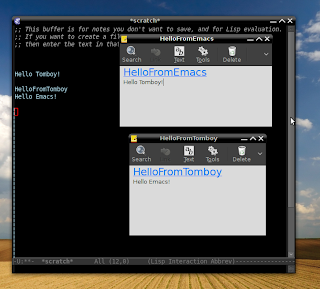 Again, this is more to show the use of dbus from emacs than about Tomboy itself -- but it is somewhat useful. I'm actually not using Tomboy so much anymore - org-mode better fits my emacs-centric workflow. But Tomboy has some very interesting plugins which might be nice for org-mode as well. As I said before, Tomboy is only an example here -- there are many other D-Bus services available ('dbus-list-activatable-names') And D-Bus services are introspectable - you can search through them, and retrieve information about the interfaces they provide, as well as the methods and signatures. Again, the Emacs D-Bus infopages are quite useful. Should I run emacs with any special option to use dbus from it? Or it works only if I build emacs from source with option --with-dbus ? @Dmitry: no idea... i am using emacs-snapshot on ubuntu 8.10. even if the 8.04 version was not compiled with --with-dbus, but it shouldn't hang. now (require 'dbus) works fine. how can I start other services? @Dmitry: if you have installed any programs that support dbus, they should be available when you start dbus. Awesome! :) We can use dbus to show notifications (org.freedesktop.Notifications) on different events, for example on incomming jabber messages.